New York City is a great inspiration for black and white paintings. I really enjoy doing these as it is relaxing to concentrate on the values and forms just using a tube of titanium white and ivory black. Over the years I have experimented with different blacks and have also mixed my own chromatic blacks to good effect. However this time I wanted simplicity (just out of the tube) and the warmer tone of the ivory black. For this painting I toned the panel first with a midtone mix of the titanium and ivory and then just dug in when it was dry. Needless to say this was not painted on site. What I like to do when I have the itch to paint NYC and can't be there is go to Google maps street view. That way I can walk up any avenue to whatever view I desire. This view up Lexington was from downtown, I think I was at about 36th street. I wanted to go far enough down to get a good image of the Chrysler building which is why I chose Lexington Avenue. I think the Chrysler is one of the best buildings in New York. Of course the weather was my invention. The view on Google maps was of a bright, sunny day. Once I have a general feel for the placement of the buildings I just take some characteristics of them and then invent. 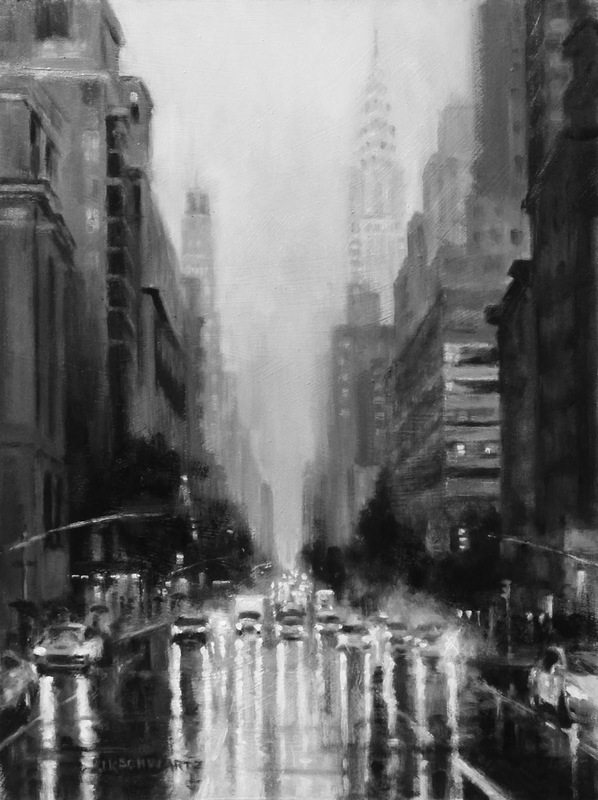 I have been painting rainy day street scenes for a long time so I can just create that on my own. The idea is for the scene to look right to a New Yorker but on close view they would tell you that building isn't there or that one doesn't really look like that. They would, however recognize the Chrysler which even though it is shrouded in mist was the reason for the painting.